Watching it live on Euronews right now. Splendid sunshine in Madrid ,the city looks wonderful with all the flags .The King,Queen and daughters are just about to leave the Cortes. Very colourful and spectacular with the plumed helmets and shiny breast-plates of the horsemen; all the flags waving, and their banners and pennants. Well, it is very clear that it is all about Felipe since he is standing in the car while his wife is seated. Before the military passed she also took a step back at the platform, as did her daughters. I wouldn't have minded her receiving a bit more attention, she has been an impeccable princess of Asturias. But at parlament she was mentioned and received applause and it is her husbands day after all. Large crowds along the route IMO, 10 rows or more in most areas (and it is a long route!). 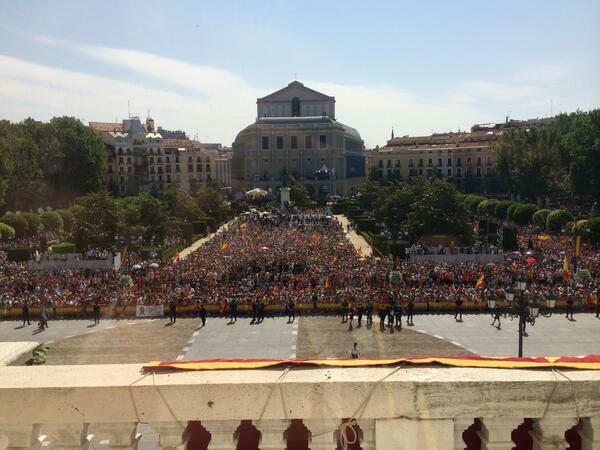 Nice to see so much enthousiasm and so many Spanish flags. Unlike the correspondant of 'The Times' I didn't see any republican flags on TVE. Madrid is a beautiful city btw. The commentator on Euronews is bugging me,firstly he referred to to Elena as Infanta Cristina,next he called the father of JC the 'Duke of Barcelona' and then said his name was Alfonso.He later corrected himself and said Infanta Cristina wasn't present ,the profile of Letizia 'the Commoner Queen' as she was dubbed was less than flattering. Great Ovation for his Father who was not there and two times Standing Ovation for Queen Sofia who was there. Long live the new Royal Family! I think there are more people here than in both the Netherlands and Belgium, this is a much longer route. I don't think that the ceremony would have been very different in other economic times TBH. This is the tradition in Spain. There seems a lot of pageantry, due to the military escorte. Juan Carlos just arrived at the palace. I had not expected so many people in the streets. This huge turn up must be very reassuring for the new king (and the old one). I wonder if the court expected it. What a great day and what a wise decision of king Juan Carlos. I hope that the international press will highlight the huge support too, since the protests received so much attention. A great way to start a reign. They have arrived safely at the palace. Delighted to see such large happy crowds to greet the King & Queen along the ceremonial route and in front of the Palace. Such a remarkable & historic moments for all Spanish people !! Agree, Madrid is a very beautiful city. Long live for the new King and Queen of Spain! Bells ringing at the Almudena Cathedral. This was not a low-key ceremony, a fantastic day for Spain. Did they change the background of the coat of arms? Wasn't it blue before?